Huntsville Hospital is the first in Alabama to offer Mazor X, the world’s most advanced robotic navigation system for the correction of severe spinal deformities, spinal stenosis, and other spine conditions. Using Mazor X’s powerful 3D surgical planning software and pre-operative CT scans of the patient, the surgeon is able to map out the procedure ahead of time and even simulate how it will improve the patient’s posture. Once the procedure is under way, the Mazor X robotic arm guides tools and implants at the proper trajectory and position according to the surgical plan. The system’s camera verifies the positioning before the surgeon acts. The system's robotic precision allows surgeons to place pedicle screws in about half the time of a typical spine operation. A pedicle screw is a bone screw made of titanium that’s used to help correct spinal deformities and treat spinal trauma. 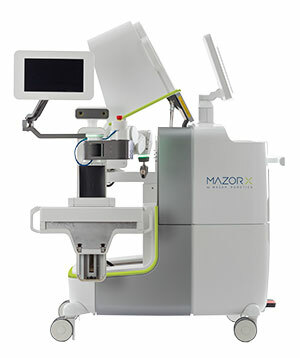 The Mazor X system is particularly useful in complex scoliosis and spinal revision surgeries that require a large number of screws to stabilize the spine, as well as in minimally invasive procedures. Because those procedures can be done more quickly and accurately with the aid of the robot, patients generally spend less time under anesthesia, go home the hospital sooner, and have fewer post-operative complications.